The Bonavita BV1900TS is the latest edition in coffee brewers by the brand. Bonavita is a name well known and respected in the coffee world. With a design that blends convenience, simplicity and quality, the BV1900 is an ideal coffee brewing system for informal environments. Perfect for home or office, this model is designed to provide the perfect cup of coffee each and every time with no fancy controls and buttons, just the ones, required. There are actually 2 variants of this model namely BV1900TD and BV1900TS. The TS is the easier and simple version that mostly resembles the older BV1800 whereas the TD comes with digital controls to monitor and tweak the coffee preferences. We will review the BV1900TD model here as it is the simplest and preferable variant. The large, shower head style brew spout of the Bonavita BV1900 is designed to provide even water coverage to the entire surface of the coffee in the brew basket. This ensures that all grounds have equal saturation, thus guaranteeing that none of the coffee goes to waste. This is a huge improvement over brew spouts that simply trickle water through the grounds, leaving the grounds around the edges largely unused. The heating element being in the BV1900 is of 1500W, which is 100W greater than it’s predecessor BV1800. It brews a little quick and hence saves some time. An easy to use interface means that you are only ever a single press of a button away from enjoying a perfectly brewed pot of coffee. Bonavita has balanced simplicity and performance in the design of its interface, which means you can customize your coffee without a need to be a computer programmer in the process. The brew cycle of the Bonavita has an optional pre-infusion feature. This feature, known as a ‘bloom’ feature, dampens the coffee grounds prior to actual brewing. This technique has shown to increase the flavor strength of the coffee you use, ensuring a richer, bolder cup of coffee each and every time. The boiler system of the Bonavita BV1900 is designed to not release water for brewing until it has reached an optimum temperature of around 200 degrees. This guarantees that each pot of coffee you brew will be of the highest standard, using water that is the perfect temperature for extracting the full flavor of the coffee you use. The boiler system will maintain the water at a temperature of around 200 degrees while the unit is on. This means you won’t have to wait for it to heat up for your next pot of coffee. The designers of the Bonavita understand how busy and so many distractions you probably have. Thus, they know the last thing you need to worry is whether or not you turned the coffee maker off. An automatic power-off feature will turn the Bonavita BV1900 off after 40 minutes, ensuring you never have to think about such a little detail ever again! This also makes the Bonavita more energy efficient than models that continue to draw power indefinitely. This model a plus for anyone wishing to be more environmentally conscious. The Bonavita’s large capacity carafe can hold up to 50oz, providing up to ten 5oz cups. This is an ideal size for offices, where a staff of five people can get 2-cups of coffee per brew-cycle. This 50 oz size has been seen as large enough to cater to average sized groups of people, while not being so large as to allow coffee to sit unused, becoming cold and bitter. The carafe of the Bonavita BV1900 has a double wall design. This design means that it keeps in heat better than its single wall counterparts. Additionally, the double wall keeps cold air out, meaning that this carafe can be taken outdoors on a cold day to provide hot cups of coffee to those working outside. The thermal nature of the carafe also means that your coffee doesn’t have to sit on a heater, constantly ‘cooking’ all day long. This helps to keep the coffee tasting fresh, eliminating the burned taste of over-cooked coffee. The dimensions of the Bonavita BV1900 are 11 ½’’ wide, 6 ¾” deep and 12” high, making it a very compact unit. This is perfect for any place where counter space is at a premium. 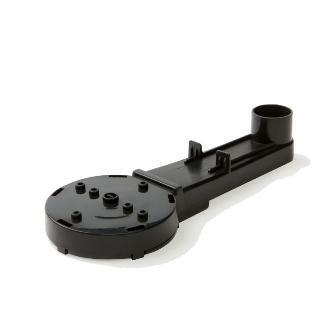 The water reservoir is also of rounded shape as compared to the rectangular shape of BV1800. With a rating of 4.0 stars out of 5 stars, from nearly 1,200 customer reviews, the Bonavita BV1900 has been fairly well received so far. The only real negative feedback has been regarding the size and design of the carafe. Additionally, the BV1900 has received recognition from Specialty Coffee Association (SCA) listing it as a Certified Coffee Brewer. Setup for the BV1900 is a snap. Simply add water to the easy to reach water-reservoir, turn power on and put filter and grounds in filter basket. Choose whether or not to ‘bloom’ your coffee, and follow the prompts of the single-touch digital interface. Once the boilers are at full temperature, the water will release to begin the brewing process. The first pot of coffee will take a total of 6 minutes or less to brew. Overall, the working is very simple to understand and replicate. Below is the video by CNET, briefing about this exceptional brewer. The boilers maintain a temperature that ensures the water from the brew spout will always be between 195-200 degrees. 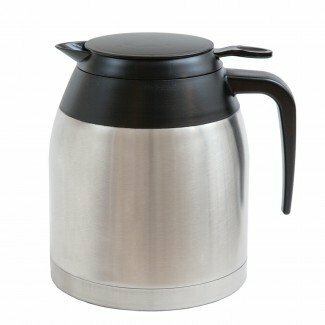 The insulated design of the coffee carafe means that coffee stays hot for up to 4 hours. The simplicity of the Bonavita’s design means that there are few components that require maintenance. Added bloom feature means that you get the most flavor from any coffee you use. Carafe spout design means that a small amount of coffee is always there in the bottom of the carafe. Requires regular de-scaling to prevent calcium buildup that can cause steam to escape around the brew spout. The carafe will only provide eight 5oz cups of coffee. While this is not necessarily a bad thing, it makes this model less capable of handling larger groups of people. Additionally, this will be a drawback for anyone who enjoys larger cups of coffee. Overall, the Bonavita BV1900 is a wonderful choice as a day to day coffee maker at home or at office. Additionally, the small footprint of the unit makes its size as convenient as its performance. It is often compared to that of Technivorm and Bunn BT. BV1900 is the upgrade version of the older model. We hopefully expect that this article will help you to know as whether the BV1900 is right for you!